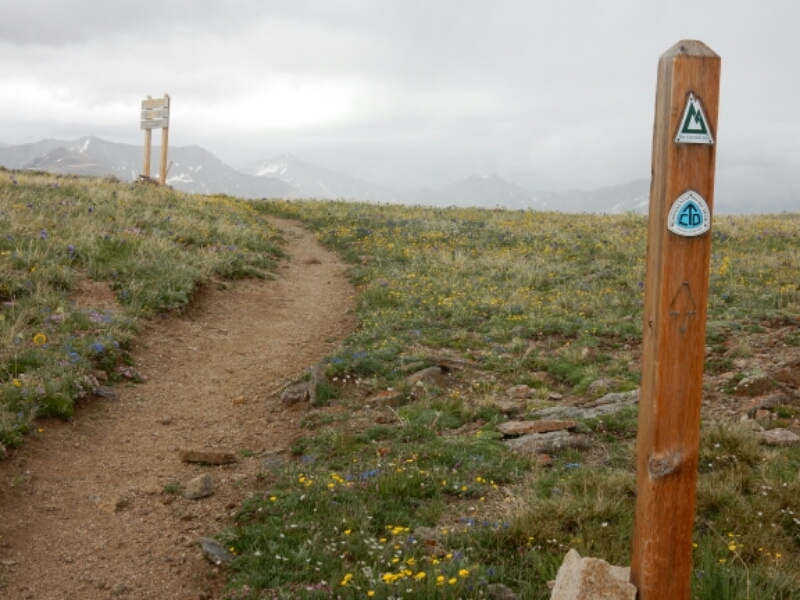 Before leaving Twin Lakes on June 28 I decided that I wanted to arrive in Breckenridge in just four days. It is 69 trail miles between the two towns, and I really, really needed to get to the post office before Saturday, July 2, when the post office closed for the 3-day 4th of July weekend. This meant I would have to hike at least a couple of 20+ mile days, something I had not done for ten days. This was not the easy, flat Cochetopa Creek valley I hiked back then. Instead, I would be hiking over a couple of passes higher than 12000 feet, and climbing steep ascents in rough terrain. After hiking on the first morning out of Twin Lakes I caught up to Warrior Hiker Lucky. Like the other Warrior Hikers, Lucky is using his CDT hike to get beyond his middle east war experience. I really enjoyed hiking with Lucky, and we talked about all sorts of stuff before setting up camp. I never expected to keep up with the stronger, younger Lucky, and we said goodbye on the trail on the morning of June 29. Solo again, I became immersed in my own hiking style and thoughts before camping near a highway not far from Tennessee Pass. I returned to the high country in dramatic fashion. About 100 feet below 12200 foot Kokomo Pass it began to rain and hail, and continued to do so as I traversed three miles toward Searle Pass, another 200 feet higher. 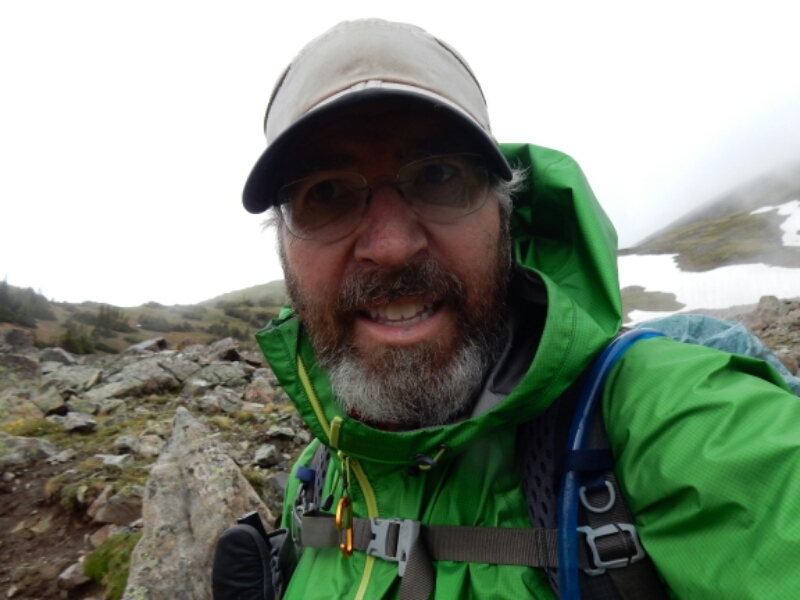 The wind picked up, and the situation simply encouraged me to delay a lunch stop and keep moving across the wet, muddy and sometimes snowy ridge. I was so pleased when I reached Searle Pass. It was downhill to the Copper Mountain ski resort town. 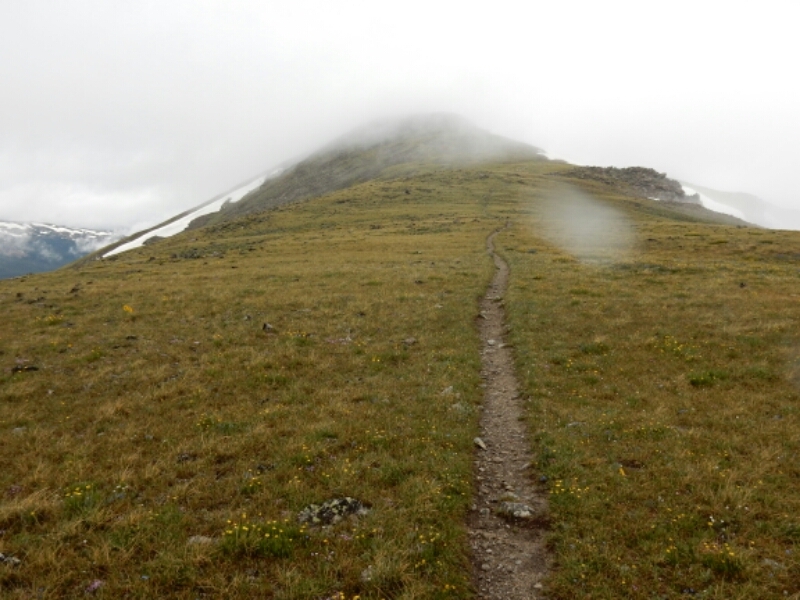 I had a similar but not as dramatic ascent up the Ten Mile Range on the way to Breckenridge. 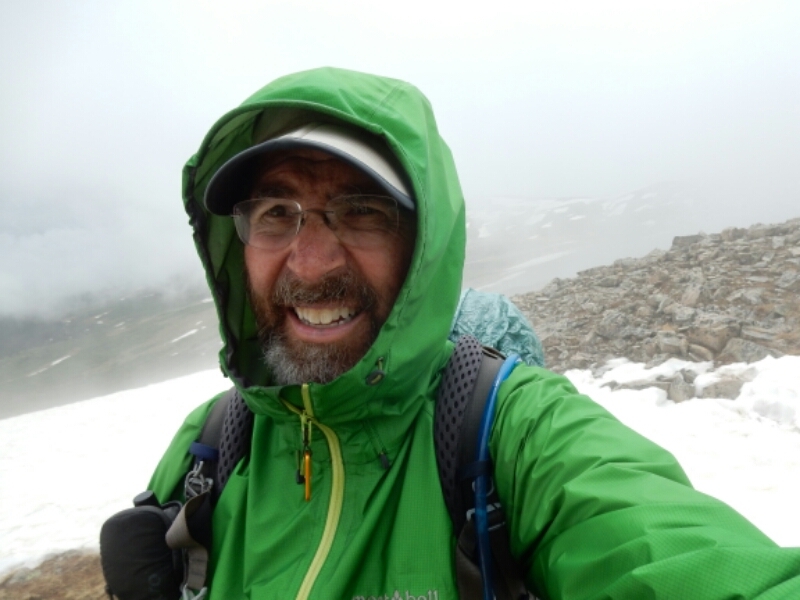 It had rained much of the evening of June 30, and I lucky that only a drizzle and light wind persisted as I climbed toward the 12500 foot high point we’ll above the Breckenridge ski runs and chair lifts. These lovely wildflowers seemed to be looking in my direction as I hiked by. It was important on those days of climbing to pass level to reach the highest areas before afternoon thunderstorms hit. Still, it is expected to get rained and hailed on while hiking the CDT. 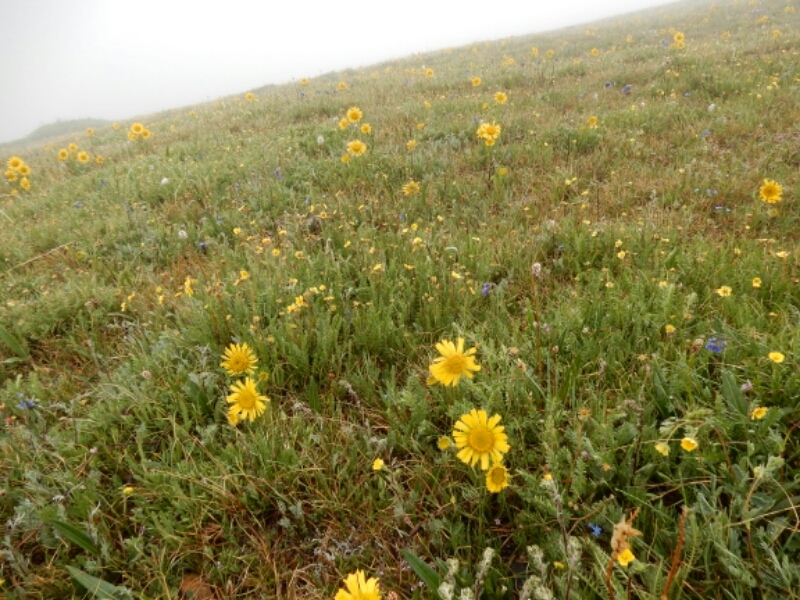 The mountains and the wildflowers are just as beautiful in bad weather, perhaps more eerie behind a windy, foggy cover. I love seeing those flowers. Keep up the good work. And you are LOOKING GOOD! Just finished watching the 4th of July parade in the little town of Ocean side, Tillamook county. Very unique very funky but the Star Spangle Banner song was good to hear. Glad to hear you’re making good progress. 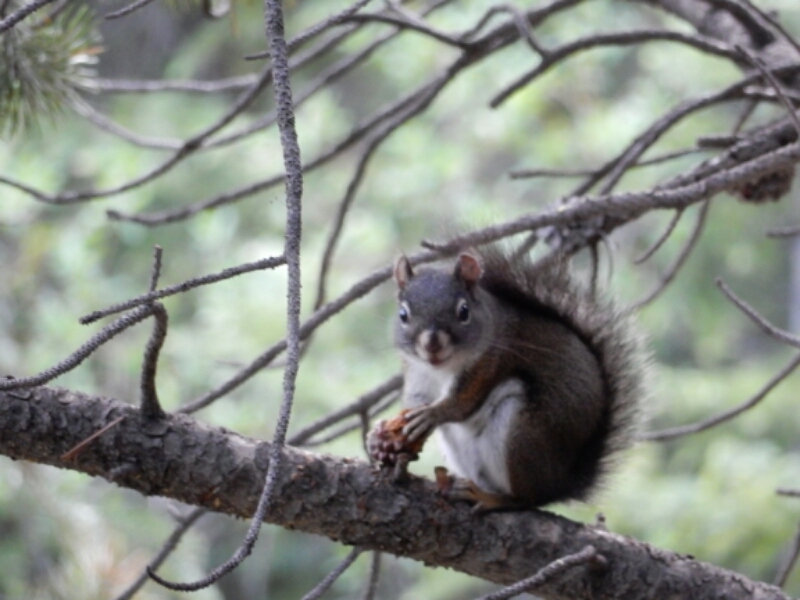 Love the squirrel and the beautiful flowers along the way. Take care. Love hearing of your progress on the trail. Jim is doing well. He’s my miracle man. Beautiful pictures. Keep up the good work! HAIL, what is it good for?